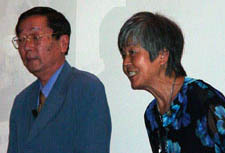 The book 'Message from Water' written by Dr. Masaru Emoto has topped sales. Since it became known that he was going to hold a speech in Munich in the middle of July 2001, 500 seats had been sold so quickly that a second date had to be set the next day, Tuesday, at 10 am. You would think that at such a time in the middle of the week hardly anybody would have attended, nevertheless there was an audience of 350 people. Emoto amused the audience right at the beginning of his speech by stepping on the middle of the stage, producing his camera (how can you tell the difference of a real and a fake Japanese? The fake Japanese won't have a camera) and taking a picture of the spectators. He said he had done it because otherwise nobody at home would believe that so many people in Europe turned up and listened to his speeches. What does Masaru Emoto do? In brief, he distributes single water drops of different waters in little bowls and freezes them at -20 degrees centigrade. The water congeals to a hemispherical shape with a tiny little peak on its highest elevation. If you look at this elevation in the laboratory under a microscope at a 200x magnification, you will notice a structure in the water, or you don't. Emoto found out that healthy water builds a hexagonal crystal structure and bad water doesn't. Healthy is pure spring water and unhealthy is almost every tap water, water from stagnant lakes, water that contains toxins or has been put into the microwave, etc. In Manhattan, New York the tap water contains as the only one amongst the tested, little crystal structures. The people over there store their water mainly in cisterns made of pine, on the roofs. Obviously the water 'likes' that, whereas in Japan the tap water looks unusually disgusting, mainly because it contains a lot of chlorine. Nevertheless almost everybody drinks this tap water and over 20 percent of the population suffers from allergies. Emoto likes to think that there is a possible link. The human being consists of 70 percent water and if the quality of the cellular water is low, all of the body's defences are unbalanced, but you can do something about it, and we are going to explain more. In the last 8 years there have been more than 10,000 pictures taken of water drops under the microscope. Some of them are published with explanations in a pictorial (English-Japanese with a German booklet) called 'Message from Water'. One of his most important discoveries in all of those years was that the state of the water is not stabilized but influenceable. Very unmistakeable and reproducible at any time the structure of water reacts on vibration, music, the power of thought and words at any time. Emoto showed the audience a variety of slides of beautiful, creative crystals and he sang to them, showing what melody he exposes to water (distilled water was the original water he used in his experiments). As soon as the audience recognized one of the classic melodies, they started to hum along and all of a sudden everyone joined in. Shortly afterwards everybody burst into laughter since it sounded more like being in a church than at a scientific lecture. The only thing he wasn't able to sing was Heavy Metal. 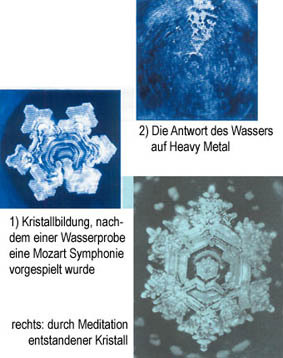 Obviously the water didn't like the sound test because it didn't build any crystals but a few harmonic constructions (see photographs: first picture Emoto and translator). Now you would think that music on one hand is a matter of taste but on the other hand they think that distilled water considers the different styles of music dispassionately and has developed no 'personal' taste. If therefore distilled water doesn't like Heavy Metal it has to be concerned that the human cellular water shows similar tendencies. The effect, even if it is basically negative, can be reduced or increased, depending on the individual. We are going to learn more about it at the keyword 'love and gratitude' further down in the article. Even nowadays Japanese are convinced that rice wine only tastes nice if it has been sung to at the production of it. They say that also in Germany when producing wine, it is going to be at its best if a young girl sings to it. You can explain that by way of Emotos' water crystals. At a stagnant lake in Japan, Emoto held a meditation and little fire ceremonials for the lake with a group of people. This lake shortly afterwards started to build the first simple water crystals. In the local news everybody was wondering the following summer why the lake didn't start to stink for the first time in years! Years later everything reverted back to the old situation because the meditation was obviously not enough for a long term effect. Different mantras and the chants and meditation of monks which are experienced to sink deep into silence, help to construct the most beautiful crystals (see photograph above). As a result many spiritual chanting rituals get a new scientific meaning. If somebody sings beautiful songs and mantras builds a higher structural order in his cellular water and this strongly stimulates the self healing power in the whole organism (even a completely stagnant lake stops to stink). As a consequence there is a link to the theories of group-consciousness-researchers which assume that in a type I civilisation, mankind would have the power if they would be aware of their power in a positive way, to gain control over environmental pollution and natural disasters only with the joint power of thoughts and positive emotion. See the article 'Hyper communication of DNS' in the Online-Magazine. Interesting with Emoto is as well that it is obviously sufficient to label the water samples with certain expressions and they react on it according to the quality of the expression. If you label the water sample with the words 'demon' or 'you idiot', the water looks ugly, sticky and has no structure (Emoto has many examples of it in his pictorial). If you label it with positive expressions, it immediately forms different hexagonal crystals with the most varied features. However, the water is 'clever'. It doesn't matter if you label the samples in German, English (wisdom) or in Japanese characters. Water recognizes that it is the same term and forms very similar looking crystals to it. The most beautiful, most noble and impressive crystals of all are built when using the combination 'love and gratitude'. And again it didn't matter to the water in what language the expression was used. Emoto showed the results of 3 languages another time and the similarity of the crystals was instantly evident. This reminds me of the article 'Hyper communication with DNS' in which is written that our DNS (residence of the genetic information) is built on the same basic rules as any language in the world. In other words, in nature everything is connected to anything. No matter where, in the DNS or in water: the worlds languages have developed from the primary existence and the DNS. Therefore it is not important if you write 'love and gratitude' or 'Liebe und Dankbarkeit' – the nature itself understands that it is all the same. I personally go all goose-pimply because I find it simply brilliant. You can even place a sample of distilled water on a photograph and you will get an 'opinion' of the water to the relevant motive. It likes dolphins because after spending 4 hours on a photograph of leaping dolphins it builds the most beautiful and harmonic crystals. A Japanese delegation visited England to examine the corn circles some time ago. The night before they departed they wished for a souvenir-corn-circle (no wonder – the Japanese are a funny crowd). To no surprise they even got it. The corn circle had the shape of an object from the Japanese art of folding paper – Origami. The interesting thing is, that the water sample that had been placed on a photograph of the corn circle, looked like an Origami work of art. Emoto finds that the crystal looks like a technical UFO. I find it looks as technical as the souvenir-corn-circle for the Japanese. Obviously it is built with some primary energy of nature which has been recognized and copied by the water. Since the terms 'love and gratitude' in combination develop the strongest and fastest self healing power, it has to be advised to stick them on your own drink water bottles. Distilled water in front of a switched on television set (political program), in a microwave, in front of a PC or close to a switched on mobile phone shows pictures of cancer like ulcers without crystals. Worst effect has – according to the pictures -first of all the microwave, followed by the mobile phone, then the PC'S and the TV set. Whereas constructive nature programs (without being watched by anybody else but the water) cause the forming of simple crystals. Apparently it depends on the information which is transmitted together with the vibrations. One thing is for sure, the human being that exists within a feeling of love and gratitude is less influenced by negative waves of mobile phones, etc. than somebody who is in a monotonous every day live mood. Water which is labelled with the expression 'love and gratitude' is not influenced by negative energy. As soon as you label it with those terms it starts to build crystals despite being placed in front of microwaves or TV sets!! Comment by Barbel: Everybody who is ordering with the universe (including myself) should take something to heart: It proves the importance of taking care of yourself and to feel happy first of all before you place an order, because you would destroy all antennas in the cellular water and within yourself if you are in a bad mood and it would destroy any healthy intuition which could lead you at the right time to the right place to receive your order!! Long live Emoto. He confirms scientifically what many of us have known intuitive for a long time. By the way, even from a distance prayers and good thoughts produce crystals in the water sample. It works best when you ask children in their inner purity and innocence to send good thoughts to a glass of water which is for example placed on the desk. It doesn't show any production of crystals until the child starts sending, and if there are many children sending a friendly and joint thought to the glass of water from a distance, than it starts building crystals. Gigantic! There is proof for the effect of healings from a distance. A last nice example: Emoto irradiated distilled water samples with aromatic chamomile and fennel oil (with a bio-energetic tool). The water built crystals which were similar to the shapes of chamomile and fennel blossoms. Here you can see how intentionally nature chooses its shapes. Like we use to say that the tendencies and characteristics are reflected in the physiognomy of a person (which says nothing about the positive or negative use of it) thus plants take on the shape which matches their inner vibrations. Everything is connected with anything.